Greg Canote has spent most of his musical life singing and playing fiddle with his twin brother Jere as The Canote Brothers. 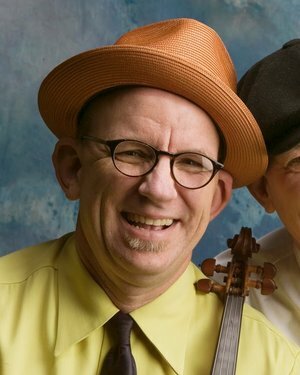 He has played hundreds of square dances with his brother and with dance icon Sandy Bradley (Small Wonder String Band). While his first love is old-time, over the years, he has also dipped his toes and fingers into Bluegrass (Curly Maple), 1920’s (Volunteer Park Conservatory Orchestra), Ragtime (Bing Bang Boys), Country (El Rancho Cowboys), Swing (Canote Brothers) and Honky Tonk (Honky Tonk Review). For thirteen years, Greg and Jere were the affable, musical side-kicks on National Public Radio’s “Sandy Bradley’s Potluck” out of Seattle, and the two have led a successful, ongoing, stringband workshop there since 1983. Greg has been on staff at many festivals and workshops in the states, including the Swannanoa Gathering, Augusta Heritage Workshop, Mars Hill Blue Ridge Old-Time Week, Pinewoods, Puget Sound Guitar Workshop, NimbleFingers, The Festival of American Fiddle Tunes, and American Banjo Camp.